“As the dis­par­i­ty between rich and poor expo­nen­tial­ly widens, and the lever­ag­ing of con­cen­trat­ed power is placed in the hands of fewer and fewer people, the planet con­fronts a laun­dry list of perils the scale of which is apt to leave the most stal­wart activist awestruck and mute. And, more parochial­ly, the ques­tion arises – what is a film­mak­er to do? (…) If John Dewey’s assess­ment was cor­rect that ‘Pol­i­tics is the shadow cast on soci­ety by big busi­ness,’ then these are films seek­ing to pierce the murk, spark­ing and splay­ing all kinds of inter­est­ing new light” (John Gian­vi­to, sem­i­nar cat­a­logue). Gianvito’s films breathe with this activist approach, com­bined with the aware­ness of a true cineaste. The cin­e­mat­ic form of his films is extract­ed from the sub­ject matter and is more than just a con­ven­tion­al enve­lope. In his mas­ter­class, Gian­vi­to will present sev­er­al excerpts from his films and his work in the col­lec­tive project FAR FROM AFGHANISTAN. He will also explore and dis­cuss a spec­trum of film aes­thet­ics that trace the his­to­ry and spirit of com­mit­ted film­mak­ing from the past to the present. 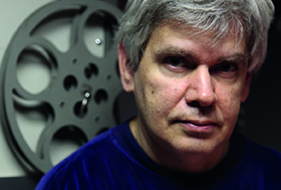 John Gian­vi­to is a film­mak­er, cura­tor and film critic. He stud­ied at CalArts and MIT Boston. He has also taught film pro­duc­tion and film his­to­ry at var­i­ous uni­ver­si­ties. In 2001, he was appoint­ed a Cheva­lier in the Order of Arts and Let­ters by the French Min­istry of Cul­ture. For five years, he was the pro­gram­mer at the Har­vard Film Archive. He served on the board of direc­tors of the Fla­her­ty Sem­i­nar 2009-13, where he is still a member of the advi­so­ry board. At present, he is Pro­fes­sor of Film at Emer­son Col­lege, Boston. John Gian­vi­to made his first fea­ture film in 1983 (THE FLOWER OF PAIN), but soon turned to essay and doc­u­men­tary works. THE MAD SONGS OF FERNANDA HUSSEIN (2001) is an essay­is­tic fea­ture about the US during the Per­sian Gulf War. In his short­est film, PROFIT MOTIVE AND THE WHISPERING WIND (2007, 58 min), he brings the audi­ence face to face with numer­ous memo­r­i­al plaques that com­mem­o­rate his­toric revolts (and mas­sacres) and that stand for the strug­gle against the loss of nation­al memory. He then worked for years on two expan­sive projects about the health and envi­ron­men­tal damage caused by the US mil­i­tary bases in the Philip­pines in VAPOR TRAIL (CLARK) (2010, 264 min) and WAKE: SUBIC (2016, 277 min). FAR FROM AFGHANISTAN (2012) is a col­lec­tive work in which Jon Jost, Soon-Mi Yoo, Minda Martin, Travis Wilk­er­son and Gian­vi­to each real­ized their own take on the war in Afghanistan and its mean­ing for the Amer­i­can people.